Coordonnateurs : Zhou Weibiao, Hui Y. H.
Baking is a process that has been practiced for centuries, and bakery products range in complexity from the simple ingredients of a plain pastry to the numerous components of a cake. While currently there are many books available aimed at food service operators, culinary art instruction and consumers, relatively few professional publications exist that cover the science and technology of baking. In this book, professionals from industry, government and academia contribute their perspectives on the state of industrial baking today. 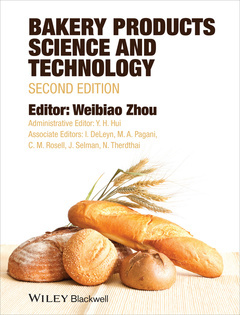 The second edition of this successful and comprehensive overview of bakery science is revised and expanded, featuring chapters on various bread and non-bread products from around the world, as well as nutrition and packaging, processing, quality control, global bread varieties and other popular bakery products. The book is structured to follow the baking process, from the basics, flour and other ingredients, to mixing, proofing and baking. Blending the technical aspects of baking with the latest scientific research, Bakery Products Science and Technology, Second Edition has all the finest ingredients to serve the most demanding appetites of food science professionals, researchers, and students. 1. Introduction to Baking and Bakery Products. 2. Wheat Milling and Flour Quality Evaluation. 3. Wheat Flour: Chemistry and Biochemistry. 6. Barley, Maize, Sorghum, Millet, and Other Cereal Grains. 10. Ascorbic Acid and Redox Agents in Bakery Systems. 12. Lipids: Properties and Functionality. Part 4: Baking Science and Technology. 17. Mixing, Dough Making, and Dough Make-up. 20. Packaging and Shelf-life Prediction of Bakery Products. 21. Process Optimization and Control. 22. Sensory Attributes of Bakery Products. 23. Nutritional Attributes of Bakery Products. 24. Browning in Bakery Products: An Engineering Perspective. 26. Rheology of Bread and Other Bakery Products. 30. Frozen Dough and Par-baked Products. Part 6: other bakery Products. 35. Pretzel Production and Quality Control. 36. Bakery Products of Unconventional Flours. Part 7: Examples of World Bakery Products. 38. Specialities from All Over the World. 39. Bakery Products of China. 42. Bakery Products of Turkey.